Ascending Butterfly: Weekend Inspiration - Ordinary People Extraordinary Talents! Weekend Inspiration - Ordinary People Extraordinary Talents! Today's Words Of Inspiration are going to be a little different today! The Ascending Butterfly celebrates its 2 month 'Blog-a-versary' today! Thank You loyal readers, for choosing to spend some time each day with us. Last night I had the amazing fortune to be able to attend John Legend's Madison Square Garden Performance, VIP Style. 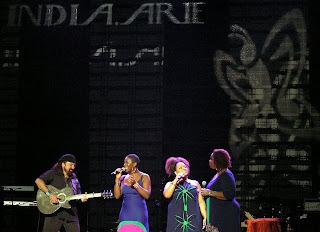 The concert 'opening act' was none other than India.Arie! And that was just one of many surprises the night had in store. I arrived early enough to watch the set up process and what did I see? A HUGE BUTTERFLY on the screen!!!! 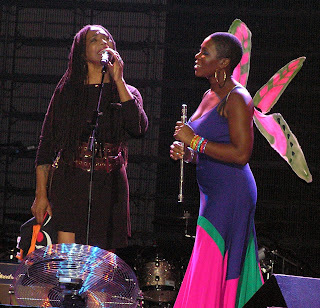 I already love India.Arie's style, flow and music, but that just cinched it, seeing that butterfly let me know that I was in the right place at the right time. She started in prayer and John Legend ended in prayer as well. I'm all about living in gratitude and this concert certainly filled my soul on many levels! 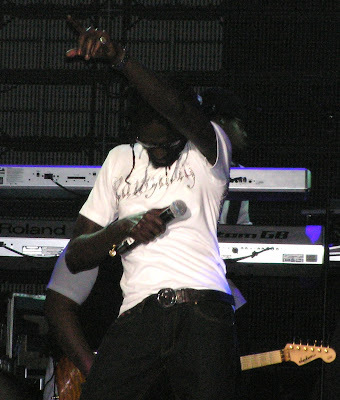 We had amazing seats (Thanks J.T./Madison Square Garden/and Hot97). We were about 3 seats away from a celebrity! Malcolm-Jamal Warner (you may remember him as 'Theo' from the Cosby Show) was sitting in front of us! Since the concert started with India, so will I. I was too happy to see her big butterfly on screen, and she even comes out during the concert wearing butterfly wings! That was just one of many amazing songs sung by India.Arie during her set. It was a mix of old favorites and tracks off the new album. ABOVE: India.Arie walking down the main aisle. Look at that smile! Her voice and her amazing smile, lit the garden up! And the energy she gave out to the audience was extremely uplifting and positive. 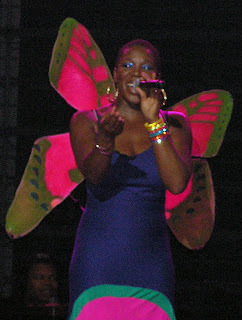 ABOVE: India.Arie in her butterfly wings! ABOVE: And she brought out a special guest towards the end, HER MOM!!! I'm very close with my mom and it was so nice to see India.Arie's mom perform with her on stage! The apple didn't fall from the tree! Two beautiful women, Two powerful Voices, two happy spirits. 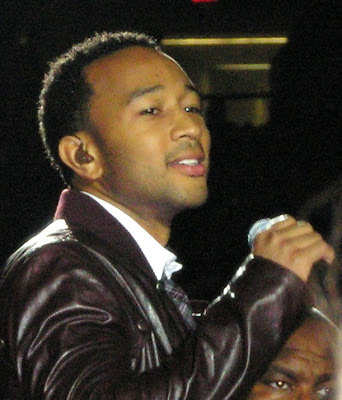 The night's headliner John Legend, started out singing directly in the heart of the audience. I will admit it was hard to hear him over the screams of the crowd and shrill shrieks of the delighted ladies for the opportunity to touch him or grab his hand as he tried to make his way to the stage! 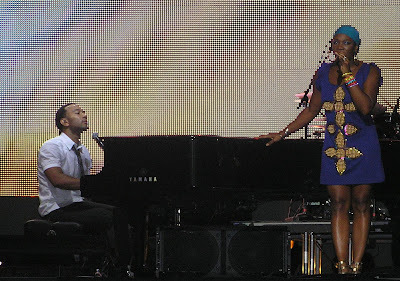 Like India.Arie, John Legend put together a great combination of his well known tracks blending with tracks from his new album. And there was so many amazing performers that took the stage with him, Rick Ross, Buju Banton, Kanye West and Estelle, and not to mention India.Arie! I've always liked reggae and dancehall and was happily surprised to see Buju Banton take the stage! Above: Buju Banton takes to the stage! As you can see from this pic he was feeling the love! The concert began and ended in prayer and folks rarely sat down, it was an on your feet, begining to end high energy and very electric night that ended with me actually getting the chance to meet John Legend in person! Ordinary People, Extraordinary Talent! Do something out of the ordinary this weekend! And listen to great music while you're doing it!